• Man, the living creature, the creating individual, is always more important than any established style or system. • What you habitually think largely determines what you will ultimately become. • Take no thought of who is right or wrong or who is better than. Be not for or against. • Reality is apparent when one ceases to compare. — There is “what is” only when there is no comparison at all, and to live with what is, is to be peaceful. • A good teacher protects his pupils from his own influence. • Always be yourself, express yourself, have faith in yourself, do not go out and look for a successful personality and duplicate it. • If you always put limit on everything you do, physical or anything else, it will spread into your work and into your life. There are no limits. There are only plateaus, and you must not stay there, you must go beyond them. • Do not deny the classical approach, simply as a reaction, or you will have created another pattern and trapped yourself there. • Real living is living for others. • I’m not in this world to live up to your expectations and you’re not in this world to live up to mine. • Many people dedicate their lives to actualizing a concept of what they should be like, rather than actualizing themselves. This difference between self-actualization and self-image actualization is very important. Most people live only for their image. • It’s not the daily increase but daily decrease. Hack away at the unessential. • The stillness in stillness is not the real stillness; only when there is stillness in movement does the universal rhythm manifest. • As love grows older, our hearts mature and our love becomes as coals, deep-burning and unquenchable. • A good martial artist does not become tense, but ready. Not thinking, yet not dreaming. Ready for whatever may come. When the opponent expands, I contract; and when he contracts, I expand. And when there is an opportunity, “I” do not hit, “it” hits all by itself. • If nothing within you stays rigid, outward things will disclose themselves. Moving, be like water. Still, be like a mirror. Respond like an echo. • Things live by moving and gain strength as they go. 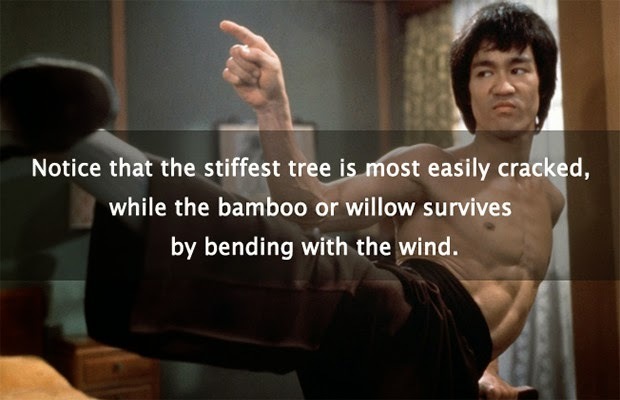 • Notice that the stiffest tree is most easily cracked, while the bamboo or willow survives by bending with the wind. • A wise man can learn more from a foolish question than a fool can learn from a wise answer. • If you don’t want to slip up tomorrow, speak the truth today. • A quick temper will make a fool of you soon enough. • The knowledge and skills you have achieved are meant to be forgotten so you can float comfortably in emptiness, without obstruction. • If you want to learn to swim jump into the water. On dry land no frame of mind is ever going to help you. • If there is a God, he is within. You don’t ask God to give you things, you depend on God for your inner theme.